Over the last two weeks or so I have received a ton of mail, from trades, for no reason from people, and from eBay bargains. While I am going to have to admit I have no idea who gave me what, or what came from where now, I love it all. In my defense, I always email people to let them know I got stuff. First I want to thank REALjtCarter, from Twitter for sending me a boatload of Jeter, Bernie, Girardi, and others. The cards were awesome. beardy sent me some 2004 Finest cards of Jeter, A-Rod and Albert as well as a 2009 Finest Pujols refractor. I already logged all the cards in and put them away and I am too lazy to take them out and scan them. 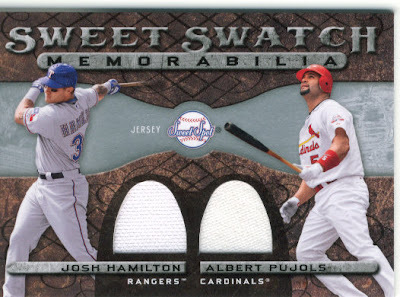 Two 2009 Sweet Spot cards that I traded some Ballpark relics, and something else. I remember when I opened the dual relic I had no idea why someone sent it to me for no reason... took me like an hour to remember where it came from, why and what I sent. These I know came from eBay, the Unique card cost a whole 99 cents, and the Bowman's Best was $3.00. I am a big fan of getting a great card for less than the cost of the pack. 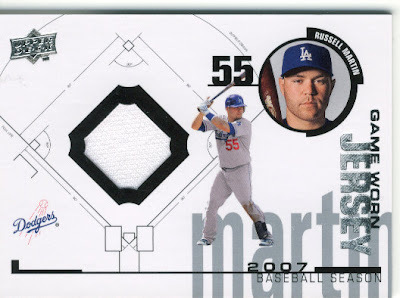 The next card I got the first time on eBay, forgot that I won it, paid for it 7 days after the auction and the guy said it's not for sale anymore. He refunded my money, and then re-listed the card (d-bag). Then, Sooz went to the card show in PA and found someone selling the card for $5 so I told her to grab it. It actually saved me a buck by him sending my money back since I would have cost about $6 or so with shipping. When Sooz brought me the card I gave her two options, cash or cardboard (even though I was going to give her both once I got change), and she took cardboard. She got a 2008 Inkredible Kouzmanoff auto and $5. The Kouz auto was supposed to be part of her Christmas gift but I didn't want her to end up buying it before hand. 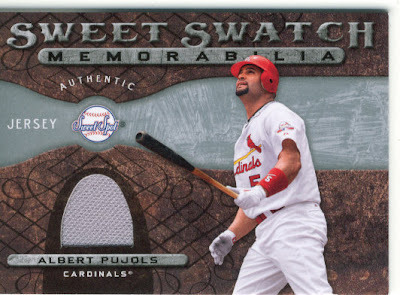 Sooz also brought me this card that she got doing a box break of 2008 Upper Deck. Between my birthday and all of these cards, my PC got a nice boost to it and that makes me happy. Please check out the Sunday Question and let us know if you are interested in doing a group break with us. We are going to do some research tomorrow on different case prices, and then see what you guys think. Ohhhhh.... 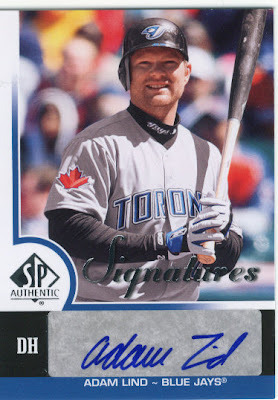 I have to pick up that Adam Lind for my collection as well. Nice one!